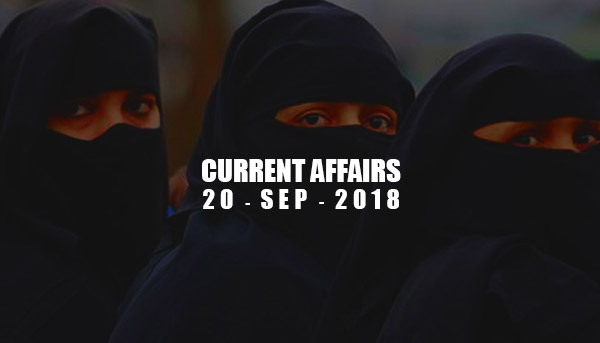 Current Affairs - Sep 20, 2018 - IAS - Daily Current Affairs, IAS Syllabus Exam Strategy, IAS Preparation. Air forces of India and Russia are participating in a 12-day drill 'Exercise Aviaindra' which focuses on anti-terrorist operations in a bilateral scenario. It is a bi-annual exercise. First Aviaindra was conducted in the year 2014. Aviaindra is being conducted at Lipetsk, Russia, from September 17 to 28. In its second leg, it will be conducted in Jodhpur from December 10 to 22. Aircraft participating in the exercise include Su-30 SM, Mig-29, Su-25, Mi-8 and An-26. Union Cabinet approves the ordinance to make instant triple talaq a penal offense. It was signed by President Ram Nath Kovind as per the ordinance making power assigned by The Constitution of India under Article 123. In a landmark verdict, five-judge Constitution Bench of Supreme Court had declared the centuries-old practice of instant triple talaq or talaq-e-biddat unconstitutional (Aug 2017). In pursuance of SC verdict, Government had managed to get Muslim Women (Protection of Rights on Marriage) Bill, 2017 passed in Lok Sabha but stuck in Rajya Sabha because of lack of consensus. Sekhar Basu, Chairman, Atomic Energy Commission (AEC) at the 62nd General Conference of IAEA held in Vienna, Austria announced that India will put four more nuclear facilities under IAEA Safeguards. These include two Russian-designed Pressurised Light Water Reactors and two Pressurised Heavy Reactors being built with Indian technology. After this a total of 26 Indian nuclear facilities will be now under IAEA safeguards. This legal arrangement of this safeguard is as under Information Circular 66 [INFCIRC 66] of IAEA, an agreement between IAEA and member states provides for the conduct of limited safeguards within the member state. Activists and villagers are raising concern over proposed 1400 MW Nuclear Power Plant of NHPC in Chutka, MP (Mandla district). There are few nuclear power reactors accorded administrative approval and financial sanction. Each site has 2 reactors. The Employees’ State Insurance Corporation (ESIC) has approved a new scheme- ‘Atal Bimit Vyakti Kalyan Yojna’ to provide cash relief to insured unemployed Persons covered under the Employees’ State Insurance Act. The relief will be payable in cash directly to their Bank Account in case of unemployment and while they search for new engagement. Renowned sand artist Sudarshan Pattnaik (Padma Shree in 2014) has been appointed as the president of the Odisha Lalit Kala Akademi (LKA). India’s first ‘smart fence’ pilot project was launched at Pakstan border. S. Jaishankar has been included on the board of US – India Strategic Partnership Forum (USISPF). Odisha government has Launched ‘StarRating’ System For Industries to Cut Air Pollution. First international Maqom musical Festival was organized in Uzbekistan. Union government along with UN body Food and Agriculture Organization (FAO) has launched an agriculture project which will be implemented in five states viz. Madhya Pradesh, Mizoram, Odisha, Rajasthan, Uttarakhand. Lewis Hamilton won Singapore Grand Prix 2018.